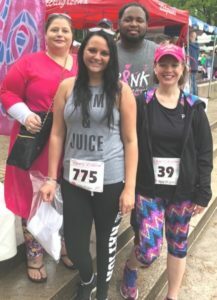 Four Charleston staff recently participated in the annual 5K Race for the Cure fundraiser for cancer research. Denice Isaacs, a veteran of many 5K runs, placed second in her age category. Above from left are Amy Hinzman, Kayla Thaxton and Cory Lowery, and Isaacs.